Campaigners fighting to save two of Camden's markets from demolition have one week left to lodge their objections. 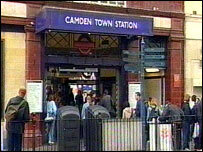 London Underground (LU) wants to use compulsory purchase powers to buy land surrounding Camden Station. It plans to create homes, shops and offices above the station, to help pay for its £130m redevelopment. But it would mean demolishing two of the area's six markets, a church community centre and the well-known Electric Ballroom venue. Campaigners see it as a battle between big business and the stall holders and claim the development will ruin Camden. Steve Lucas, from the Keep it Camden Campaign, said: "This is a terribly corporate thing they are proposing - quite honestly all it needs is a pair of shoulder pads." He agreed overcrowding at Camden Tube desperately needs tackling but thinks other nearby stations and bus routes should be better publicised. 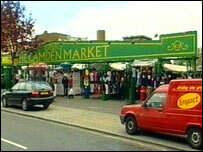 He added: "Buck Street Market has been given the generic name for all six markets - Camden Market - for several years now. "If people hear that Camden Market has closed, they will think they are all closed. That will close those markets down and ruin the area. " Transport Secretary Alistair Darling has until 7 May to decide whether to veto LU's application for compulsory purchase. Camden Station, which opened in 1907, can serve more than 28,000 people on a Sunday afternoon and is often used as an exit-only station at weekends because of overcrowding. LU says passenger numbers will increase by 20% in 20 years and the redevelopment would ease overcrowding as well as making it quicker to get between platforms. The development will have huge benefits for Camden, including homes for key workers, the company says. It was originally rejected by Mayor of London Ken Livingstone, but has been redesigned. LU spokesman Howard Collins said: "The dilemma we face is we really do need better access to and from the Northern Line and the only way we are going to do that is to create a huge space, much bigger than we have at the moment. "That not only means making a big ticket hall but getting a new escalator shaft in and widening that whole area. Unfortunately that does take up a huge amount of space." "London Underground's problem is it has too many people for too small a station."